Old house in a village with garden and games rooms. It was a pleasure for us to give new life to this house long abandoned. She now enjoys the comfort of our time, without losing the charm enhanced by exposed beams, fireplaces tufa stone, tiles of his Rairies and its timber. It is designed to accommodate 4 to 5 persons. On the ground floor is the living room: living room around the fireplace, dining area, kitchen and staircase that leads upstairs. 1st floor: a bedroom with a bed of 160 and a bathroom on the landing. On the second floor the second bedroom with twin beds. The walled garden and flowers is available, with chairs resting, garden furniture, barbecue house. You can park your car in the yard of the owners, on the back of house. This is the most beautiful place! I adored living in the village so close to Angers with all the peace of a country village. Her gardens are spectacular and so was the home. It has all the wonderful French charm one would like in a French gite. It was well equipped with all you need and the town was so quiet and comfortable. Gabrielle and her husband are a delight and I hope to stay with them again on my next visit to the area. I loved it! We had a wonderful week staying in this gite. It was clean, comfortable and well-equipped. Gabrielle and her husband were very friendly and we received a warm welcome despite arriving at past 10.30pm due to a delayed ferry crossing. 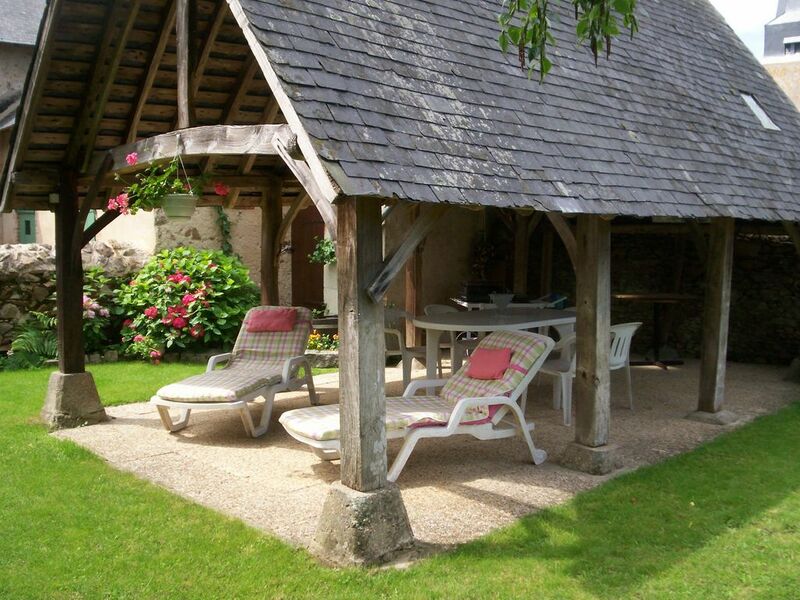 Our teenage boys particularly enjoyed the table tennis room and my husband enjoyed relaxing on the sunlounger under the open-air 'barn' roof in the garden which was truly beautiful. Merci à Claire pour cette belle appréciation. Ils ont été des hôtes très agréables. Nous avons loué quelques jours pour passer Noël dans cette charmante maison d'hôte. Un très bonne accueil. On recommande fortement !!!! Ce fut très agréable d'accueillir Virginie et Jean Philippe. Merci à eux pour leur gentil petit mot. The city of Angers is 20 minutes and throughout the season, offers live entertainment in the heart of the city or in nearby castles. la caution de 250€ est à verser à l'arrivée et vous sera restituée à votre départ si tout s'est bien passé. Les tarifs ne changent pas en 2018. Rappel : en basse saison le chauffage est à payer en plus.